For other uses, see United Kingdom (disambiguation). A United Kingdom is a 2016 British biographical romantic drama film directed by Amma Asante and written by Guy Hibbert, based on the true-life romance between Seretse Khama, heir to the throne of Bechuanaland (later Botswana, of which he was President), and his wife Ruth Williams Khama. 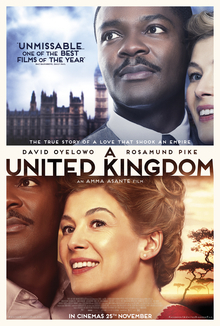 David Oyelowo and Rosamund Pike portray Seretse and Ruth, respectively. It was screened at the 2016 Toronto International Film Festival, and was the opening film at the 60th London Film Festival, the second year in a row that a British film featured. The film is based on the true story of the heir to the throne of Bechuanaland, Seretse Khama of the Bamangwato people, who studies law in London immediately after World War II. There he meets a white woman, Ruth Williams, whom he eventually marries, despite the protests of both their families and opposition from the British government, which is concerned about relations with South Africa and the stability of the entire region of southern Africa. The National Party government in South Africa fears that the marriage of a black king to a white woman in neighboring Bechuanaland will inspire unrest, and pressures the British government to end the marriage. Khama's uncle, the Regent, demands that he end his marriage to Ruth, and marry a Bamangwato princess, a demand that Khama rejects. The British administrators use the dispute between the King and the Regent to argue that the marriage of Seretse and Ruth is causing unrest in Bechuanaland. Seretse discovers that the British have allowed a US mining corporation to prospect for precious stones, and is eager to make sure that, if anything is found, the exploitation of the country's resources should solely be done by the people of Bechuanaland. Seretse wants his people to support him as king and manages to win their backing, while the British government decides to exile him from his own country. Meanwhile, Ruth has their baby in Bechuanaland and becomes accepted by the local people by "walking the road with them". When the British want to proclaim an administrator to the Bechuana people instead of their king, the tribe refuses to convene a meeting to do so. The prime minister, Clement Attlee, tells the backbencher Tony Benn, that Britain needs gold from South Africa and he is willing to pay any price such as attempting to destroy the Khamas' marriage to stay in the good graces of South Africa. During this time, diamonds are found and Seretse makes sure that the British government publicly declares that the Bechuana people have the sole right to exploit these resources. Winston Churchill promises, if he is elected in the 1951 general election, to lift the exile on Seretse, however, after his victory he turns the five-year ban into a lifelong one. In London, powerful people start supporting Seretse's claim, and he also receives support from the US government. Meanwhile, apartheid develops in South Africa and begins to overshadow Bechuanaland as well. Eventually, with the help of pressure from local people, he is allowed to return to Bechuanaland and negotiates its independence from the British. Seretse shows his uncle a leaked British government document showing he is qualified to be king, and that only opposition from South Africa is motivating the actions of the British government. Post-ending text reveals that Seretse oversees the creation of present-day Botswana, and that their son subsequently becomes the country's fourth elected president in 2008. It is revealed that Ruth and Seretse are buried side by side on a hilltop overlooking Serowe village, where they had lived for the remainder of their lives. Pike joined the cast in May 2015, with Asante joining shortly afterwards. In September 2015 Asante revealed that shooting would be split between Botswana and London, and that it would begin in October in preparation for a 2016 release coinciding with the 50th anniversary of independence in Botswana. In October 2015 actors Jack Davenport and Tom Felton joined the cast. In November 2015 some filming took place around Hyde Park/Kensington Gardens including Imperial College Union. The cinematographer was Sam McCurdy and the production designer was Simon Bowles. The film had its world premiere at the Toronto International Film Festival on 9 September 2016. It will also screen at the BFI London Film Festival on 6 October 2016. Shortly after, Fox Searchlight Pictures acquired U.S distribution rights to the film. The film was released in the United Kingdom on 25 November 2016. It was scheduled to be released in the United States on 17 February 2017, but was pushed up to 10 February. A United Kingdom grossed $3.9 million in the United States and Canada and $9.9 million in other countries for a worldwide total of $13.8 million, against a production budget of $14 million. On review aggregator website Rotten Tomatoes, the film has an approval rating of 84% based on 150 reviews, with an average rating of 6.8/10. The website's critical consensus reads, "Well-acted, solidly crafted, and all-around worthy, A United Kingdom presents an absorbing look at a singular true-life love story." On Metacritic, the film has a weighted average score of 65 out of 100, based on 41 critics, indicating "generally favourable reviews". Glen Kenny, in The New York Times, described the filmmaking as "staid" but with "an acute sense of pace". He was complimentary about the performances and described Oyelowo's as "remarkable, genuinely riveting work". In Time Out, Tom Huddleston wrote that "David Oyelowo and Rosamund Pike are strong in this compelling and moving, if basic, true-life tale" but that the film "is just a little too cosy and sentimental for its own good." ^ "A United Kingdom (2016)". British Film Institute. Retrieved 23 July 2017. ^ Goldberg, Matt (26 August 2016). "'A United Kingdom' Trailer: David Oyelowo and Rosamund Pike Take on the British Empire". Collider. Complex Media. Retrieved 23 July 2017. ^ "A United Kingdom". Pathe Productions. Retrieved 13 October 2017. ^ "A UNITED KINGDOM (12A)". British Board of Film Classification. 7 September 2016. Retrieved 9 September 2016. ^ Campbell, Christopher (11 December 2017). "The Disaster Artist' and 'I, Tonya' make their mark in an otherwise poor year for biographical movies". Film School Rejects. Retrieved 26 June 2018. ^ a b "A United Kingdom". Box Office Mojo. IMDb. Retrieved 9 March 2017. ^ Kit, Borys (26 May 2015). "'Belle' Filmmaker to Direct David Oyelowo, Rosamund Pike in 'A United Kingdom' (Exclusive)". The Hollywood Reporter. Prometheus Global Media. Retrieved 22 September 2015. ^ Jaafar, Ali (26 July 2016). "Toronto To Open With 'The Magnificent Seven'; 'La La Land', 'Deepwater Horizon' Among Galas & Presentations". Deadline Hollywood. Penske Business Media. Retrieved 26 July 2016. ^ Korsner, Jason (21 June 2016). "A United Kingdom To Open London Film Festival 2016". What's Worth Seeing... Retrieved 21 June 2016. ^ Jaafar, Ali (8 May 2015). "Rosamund Pike In Talks To Join David Oyelowo In 'A United Kingdom' : Cannes". Deadline Hollywood. Penske Business Media. Retrieved 11 October 2015. ^ Malefho, Lame (24 September 2015). "Batswana being auditioned for Sir Seretse Khama movie". The Botswana Gazette. Retrieved 11 October 2015. ^ Barraclough, Leo (10 October 2015). "'Pirates of the Caribbean' Star Jack Davenport Boards Amma Asante's 'A United Kingdom' (EXCLUSIVE)". Variety. Penske Business Media. Retrieved 11 October 2015. ^ "A United Kingdom". Toronto International Film Festival. Retrieved 15 September 2016. ^ Barraclough, Leo (21 June 2016). "Amma Asante's 'A United Kingdom' to Open BFI London Film Festival". Variety. Penske Business Media. Retrieved 15 September 2016. ^ "A United Kingdom". BFI London Film Festival. British Film Institute. Archived from the original on 28 September 2016. Retrieved 15 September 2016. ^ Lang, Brent; Seetoodeh, Ramin (15 September 2016). "Toronto: Fox Searchlight in Final Talks for 'A United Kingdom' (EXCLUSIVE)". Variety. Penske Business Media. Retrieved 15 September 2016. ^ Murthi, Vikram (25 August 2016). "'A United Kingdom' Trailer: David Oyelowo and Rosamund Pike Fight For Love & Country". IndieWire. Penske Business Media. Retrieved 1 October 2016. ^ Pederson, Erik (30 September 2016). "Fox Searchlight Bringing 'A United Kingdom' To North America". Deadline Hollywood. Penske Business Media. Retrieved 30 September 2016. ^ Morales, Wilson (19 December 2016). "Fox Searchlight To Release Amma Asante's 'A United Kingdom' On Feb. 6, 2017 at The Paris Theatre in New York City". Black Film. Retrieved 20 December 2016. ^ "A United Kingdom (2016)". Rotten Tomatoes. Fandango. Retrieved 24 August 2018. ^ "A United Kingdom Reviews". Metacritic. CBS Interactive. Retrieved 19 March 2017. ^ Kenny, Glen (9 February 2017). "Review: 'A United Kingdom' With Love That Tested Racial Tolerance". The New York Times. The New York Times Company. Retrieved 21 October 2017. ^ Huddleston, Tom (10 September 2016). "A United Kingdom". Time Out London. Time Out Group. Retrieved 21 October 2017.